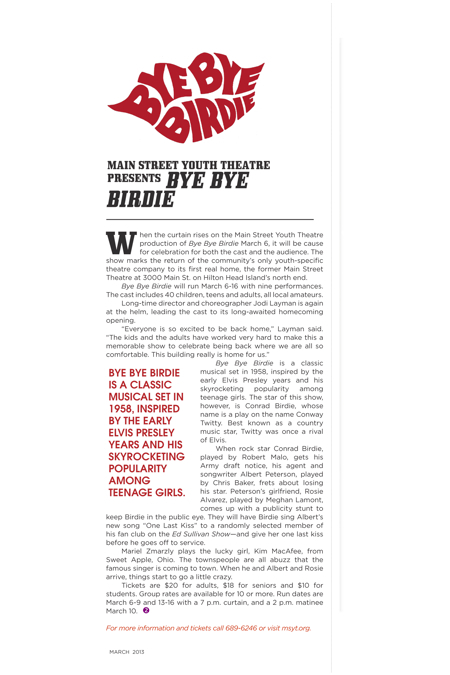 Hilton Head Magazines: CH2/CB2: Main Street Youth Theatre Presents "Bye Bye Birdie"
When the curtain rises on the Main Street Youth Theatre production of Bye Bye Birdie March 6, it will be cause for celebration for both the cast and the audience. The show marks the return of the community’s only youth-specific theatre company to its first real home, the former Main Street Theatre at 3000 Main St. on Hilton Head Island’s north end. Bye Bye Birdie will run March 6-16 with nine performances. The cast includes 40 children, teens and adults, all local amateurs. Long-time director and choreographer Jodi Layman is again at the helm, leading the cast to its long-awaited homecoming opening. Bye Bye Birdie is a classic musical set in 1958, inspired by the early Elvis Presley years and his skyrocketing popularity among teenage girls. The star of this show, however, is Conrad Birdie, whose name is a play on the name Conway Twitty. Best known as a country music star, Twitty was once a rival of Elvis. When rock star Conrad Birdie, played by Robert Malo, gets his Army draft notice, his agent and songwriter Albert Peterson, played by Chris Baker, frets about losing his star. Peterson’s girlfriend, Rosie Alvarez, played by Meghan Lamont, comes up with a publicity stunt to keep Birdie in the public eye. They will have Birdie sing Albert’s new song “One Last Kiss” to a randomly selected member of his fan club on the Ed Sullivan Show—and give her one last kiss before he goes off to service. Mariel Zmarzly plays the lucky girl, Kim MacAfee, from Sweet Apple, Ohio. The townspeople are all abuzz that the famous singer is coming to town. When he and Albert and Rosie arrive, things start to go a little crazy. Tickets are $20 for adults, $18 for seniors and $10 for students. Group rates are available for 10 or more. Run dates are March 6-9 and 13-16 with a 7 p.m. curtain, and a 2 p.m. matinee March 10. For more information and tickets call 689-6246 or visit msyt.org.